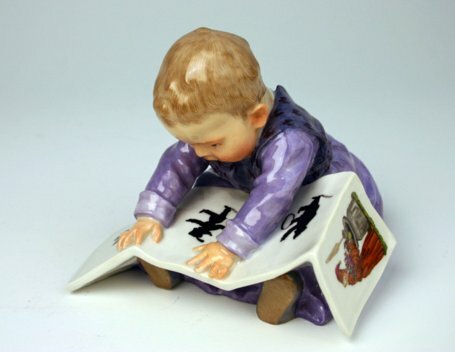 Description: Meissen figure of a seated child looking at a picture book. First modelled by Konrad Hentschel in 1904. Mark Info: Crossed swords in under glaze blue with 200 year aniversary date 1710-1910 for the founding of the Meissen Manufactory. Incised model number U 149. Impressed assembler's number 97 and painter's number 63 in black.